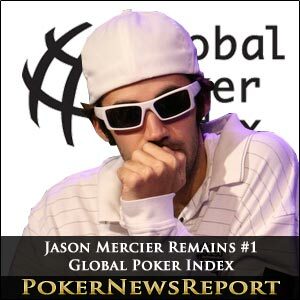 Jason Mercier has remained in the number one spot on the latest Global Poker Index (GPI) 300 rankings list for a fifth successive week – and in the process overtaken fellow American pro Erik Seidel’s record for the total weeks at the peak. Seidel had totalled 15 weeks in the top spot on February 6, but was surpassed by Team PokerStars Pro Mercier after the 25-year-old from Hollywood made it to 16 following his attaining the summit by deposing the New Yorker the following week. Mercier stayed on 2,980.42 points to actually increase his lead over Triple Crown winner Bertrand ‘ElkY’ Grospellier as the Frenchman lost 12.64 points to now sit on 2,845.12. Incredibly, the American pro has enjoyed such a wonderful recent run that the 226 points he would have earned for finishing in 27th place, for $19,200, in the $9,500 buy-in No-Limit Hold’em Championship Bounty event at the Bay 101 Shooting Stars tournament on March 9 but could not count towards his total score as his Period 1 quota is already full, did not hinder his attempts to stay top of the GPI. Mercier has seven qualifying scores for Period 1, but three have been excluded because of the maximum allowed rule – and that means that recent San Jose finish cannot be added to his total. However, Seidel – an eight-time World Series of Poker (WSOP) bracelet winner – has so far failed to shine this year following an incredible 2011 and therefore seen his ranking slip recently to a new low since the index came into operation last June. The Vegas-based pro – who started last year with victory in the AUD$250,000 Super High Roller No-Limit Hold’em event at the Aussie Millions in Melbourne for $2,472,555 before following up with three other huge successes – has dropped out of the GPI’s top four for the very first time as he lost 252.66 points to now hold 2,510.58 in fifth place. That’s the biggest points drop among the top 300 this time around and allowed Shawn Buchanan (2,711.03) and David ‘Doc’ Sands (2,533.47) to move up a place each into third and fourth respectively, even though their points totals remained static. Poker Hall of Famer Seidel lost his points after his fourth place, for $184,100, at last September’s $20,000 buy-in No-Limit Hold’em Eight-Handed main event from the Epic Poker League (EPL) Event 2 at The Palms in Vegas aged into Period 2 to leave him with just two Period 1 scores. This also resulted in the 52-year-old’s 13th place at the WSOP event #33 – the $10,000 buy-in Seven-Card Stud Hi-Lo Split-8 or Better Championship – last June 20 being knocked out by the more recent EPL score. Seidel’s fall has, however, boosted Canadian Buchanan and Sands after the American leapt 22 places the previous week into sixth spot. With British Columbia’s Buchanan (2,711.03 points) having moved into third spot on the previous GPI 300 list and Montana’s Sands now at four, the stranglehold Seidel, Mercier, Team PokerStars pro Grospellier and Ukrainian Eugene Katchalov (now sixth on 2,463.12 points) had over the top four spots has now been well and truly broken. Sands took second place, for $806,370, at last month’s $10,000 buy-in No-Limit Hold’em Championship at the LA Poker Classic (LAPC) to make the top six, but has now moved up two more spots ahead of Seidel and Canada’s Sorel Mizzi. Toronto’s Mizzi, meanwhile, can count himself unfortunate not to at least maintain his position from the previous rankings, but his $338,225 success for winning the World Poker Tour (WPT) Rendez-Vous à Paris €15,000 buy-in No-Limit Hold’em High Roller event last September aged into Period 2 to see him drop two places into seventh. That ageing score from the Aviation Club de France also knocked the 25-year-old’s 32nd place finish in event #48 – a $1,500 buy-in No-Limit Hold’em tournament – at last year’s WSOP out of Period 2 to result in the majority of his 194.77-point loss. Vegas-based Steve O’Dwyer moved in the opposite direction to gain one spot and at the same time make his debut in the top 10 by replacing fellow American Matt Waxman in 10th place. Colorado’s O’Dywer extended his good recent run by securing the €1,500 buy-in No-Limit Hold’em main event crown at the WPT National Series in Denmark for $213,796 at the start of this month. That victory ensured he had cashed 13 times – 10 of which have qualified for the GPI rankings – since pocketing $19,359 for finishing 626th in last July’s WSOP main event. The American added another $3,490 for a seventh-place finish at last weekend’s €2,000 buy-in No-Limit Hold’em Six-Max Bounty event at the European Poker Tour (EPT) Madrid to make certain that – from his 14 cashes – the lowest placing is 10th, while he has won four of those events and finished as runner-up in another three. This fantastic succession of results is reflected in his overall points score only increasing by five because his Danish success, while earning him 236 points, pushed his sixth place score for $48,568 – and 231 points – at the €3,000 buy-in No-Limit Hold’em Shootout in the WSOP Europe (WSOPE) in Cannes last mid-October into Period 2 as he already had his full complement of four scoring results in Period 1. But O’Dwyer only needed those five points to break into the top 10 for the first time as Waxman’s overall score dropped by 250.09 points when the Florida pro’s score from the WPT Rendez-Vous à Paris aged into Period 2 to knock out another score – his $12,253 for 32nd place at the $5,000 buy-in No-Limit Hold’em main event at the Deep Stack Extravaganza III in Vegas last July. That ageing saw Waxman drop seven places down to 17th, while the remaining two spots inside the top 10 were filled by Brooklyn’s Vanessa Selbst (2,405.97 points) – a one-time WSOP bracelet winner with Team PokerStars Pros – in eighth and New York State’s Will ‘The Thrill’ Failla (2,400.87) in ninth as neither made any movement on their previous rankings. Failla could even break into the top five on the next rankings list as he won the recent 100th event on the Heartland Poker Tour (HPT) in St Louis when picking up $119,064 in the $1,500 buy-in No-Limit Hold’em main event at the Missouri River City Casino. Englishman Sam Trickett fell 11 places to 29th on 2,044.91 points after he lost 135 points when his PartyPoker.com World Open VI $10,000 buy-in No-Limit Hold’em win for $200,000 in London in September of 2010 aged into Period 4 but could not be included as he already has four scores in that period. Welshman Roberto Romanello, on the other hand, moved into the top 20 by gaining seven places to sit on 2,141.7 points at 20th. The Gorseinon pro added 60 points to his overall total after his fifth place for $22,161 at last March’s €1,500 buy-in No-Limit Hold’em main event in the Full Tilt Poker Series Spain in Madrid aged into Period 3 to add to his two previous scores in that category. That Spanish result had not been included on Romanello’s Period 2 score as he already had four scoring events. Meanwhile, the Bay 101 Shooting Stars Championship Bounty event saw five familiar faces make the final table to boost their GPI rankings, with New Mexico’s Joseph Serock leading the way by returning to the list in 125th place on 1,458.17 points. The Albuquerque pro picked up 417 points for taking third place and $320,400 in the Bay 101 event to achieve his highest ranking yet. Serock’s previous best was 149th back in June of last year when the index was introduced, although he has struggled to remain inside the top 300 since. Canadian Erik Cajelais took fourth place in San Jose for $256,300 and 392 points to make his GPI 300 debut at 161st on 1,346.61 points, while the Montreal pro was joined by another rankings debutant in Bryce Yockey (1,100.52 points) at 267th after the Californian finished 34th for $16,000 in the same tournament. Sticking with the San Jose event, Connecticut’s Andrew Badecker (1,518.33) enjoyed the biggest rise of any player on the rankings – up 132 places – after earning 373 points and $192,300 for taking fifth place to sit at 103rd. Joe Elpayaa (1,460.26), of Illinois, also had a good week, picking up 121 places to take 123rd on the list for his highest ranking after securing sixth place for $128,200, while New York’s Scott Baumstein had a fine San Jose event, as well, with an eighth-place finish for $64,000 and 332 points to move up 66 places to 48th on 1,800.72. Taylor von Kriegenbergh, of Massachusetts, exited in 19th for $22,420 in San Jose to make up 122 places and take 164th spot on 1,338.92 points. The other players to break back into the top 300 are Atlanta’s Josh Arieh (242nd on 1,144.28 points) – who also cashed in the Bay 101 tournament with 22nd place for $22,420 – as well as Miami’s Randy Dorfman (298th on 1,058.35), Bulgarian Yuliyan Nikolaev Kolev (299th on 1,056.86) and Ontario’s Mark Radoja (300th on 1,056.56). But California wasn’t the only place to be as several other GPI-ranked pros made final tables around the world. Frenchman Jean-Philippe Rohr moved up an impressive 69 places into 85th – for a top 100 place for the first time – on 1,604.45 points after winning the €3,700 buy-in No-Limit Hold’em High Roller event at the WPT National Series Mauritius on March 4 for 236 points and $40,208. Also in the Indian Ocean, French rapper Bruno ‘Kool Shen’ Lopes took seventh place for $16,083 in the €1,100 buy-in No-Limit Hold’em main event to leap 41 places into 236th on 1.162.72 points, while Scotsman David Vamplew claimed sixth spot in the £1,000 buy-in No-Limit Hold’em Palm Beach Big Game in London for $5,382 to gain 27 spots and 82 points to take over at 144th on the rankings with 1,402.75 points. Expect Lopes to gain even more places on the next rankings list as he pocketed $183,660 for finishing fourth in the €5,000 buy-in No-Limit Hold’em main event at the just-completed EPT Madrid. Danish pro Frederik Jensen bested the 477-player field at the Casino Gran Madrid for a top prize of $649,368, while Canadian Mike ‘Timex’ McDonald (no change at 13th on the GPI with 2,261.14 points) took ninth for $45,915, Lock Pro Elite member Melanie Weisner (down seven places to 69th on 1,659.28), of New York, picked up $14,430 for finishing in 28th and Frenchman Tristan Clemencon (down eight to 106th on 1,507.75) exited in 11th for $32,796. Expect all these pros to should positive movement come the next GPI 300. Among the other big upwards movers were Texan Adam Geyer (up 88 places to 100th on 1,537.74 points), Florida’s Amir Lehavot (up 76 to 76th on 1,635.94), Russia’s Vyacheslav Igin (up 41 to 219th on 1,197.24), and Londoner Max Silver (up 33 to 198th on 1,256.17). With seven players either returning to the GPI 300 or making their debuts on the list, that means another seven pros had to make way – and they include Frenchman Manuel Bevand, who had been ranked since the inaugural list was released last year and even hit a high of 88th back at the start of October. Also falling off the top 300 is Muscovite Evgeny Zaytzev, who had been a constant member of the list since joining back on September 12, while the other five players to depart were French pair Stephane Benadiba and Christophe Benzimra, Lebanon’s Nicolas Chouity, Canadian Mike Leah and Joe Cassidy, of California. Of course, other players suffered huge drops without dropping out, with Vegas’ Tim West (down 82 places to 283rd on 1,084.94 points), California’s Isaac Baron (down 72 to 177th on 1,297.77) and Russian Team PokerStars pro Alexander Kravchenko (down 57 to 136th on 1,429.20) all suffering badly. Each one of these pros has been included on the GPI 300 since its inception last year, but West – who briefly made it into the top 100 – took a massive hit of 156 points when his 11th place finish for $46,020 at last September’s $20,000 buy-in No-Limit Hold’em Eight-Handed EPL main event at The Palms in Vegas aged into Period 2 to him with a blank Period 1 slate and his lowest ranking to date. That EPL cash also knocked out his fourth place for $21,966 at last May’s HPT/ Nevada State Poker Championship $1,500 buy-in No-Limit Hold’em main event in Period 2, so lowering his score further. Baron’s tumble comes about after his sixth place for $92,050 at that previously-mentioned EPL event also aged into Period 2 to knock out his 37th place for $11,652 at last summer’s WSOP event #35, a $5,000 buy-in Pot-Limit Omaha Six-Handed tournament, to see his GPI total crash by 205 points for his lowest ranking, as well. Finally, Moscow’s Kravchenko fell out of the top 100 for the first time after being ranking as high as 33rd when the GPI debuted. He lost 181 points as his sixth place for $29,500 from last year’s PokerStars Russian Poker Series (RPS) $2,300 buy-in No-Limit Hold’em main event in Kiev aged into Period 2 but is not counted because of the four-tournament cap. Also suffering big drops were Frenchman Hugo Lemaire (down 52 places to 181st on 1,291.34 points), Russian duo Dmitry Stelmak (down 46 to 227th on 1,179.94) and Dmitry Gromov (down 43 to 175th on 1,299.57), Canadian Team 888 Poker Pro Tyler Bonkowski (down 37 to 282nd on 1,085.58), Vegas-based Team PokerStars Pro Chad Brown (down 32 to 190th on 1,280.60), Parisian Guillaume Darcourt (down 30 to 241st on 1,146.47), and German Heinz Kamutzki (down 28 to 204th on 1,244.38). Remember to check back here at Poker News Report for the latest developments on the GPI.